Drive in the guide from the top of the head. Let the cylinder head cool to room temperature. Ream the new valve guide after installation. 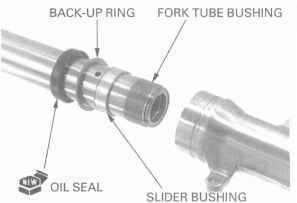 Insert the reamer from the camshaft side of the head and also always rotate the reamer clockwise. 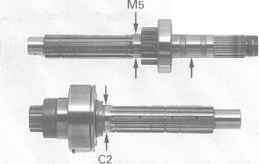 Valve guide reamer, 5.0 mm 07984 MA60001 or Use cutting oil on the reamer during this operation. Clean the cylinder head thoroughly to remove any metal particles. Disconnect the EVAP CAV solenoid valve 2P (Black) connector. 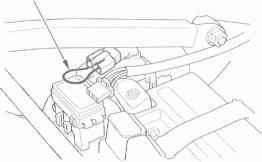 Turn the ignition switch ON and measure the voltage between the terminals. CONNECTION Black Brown ( + ) Green ( ) STANDARD Battery voltage If there is battery voltage, replace the EVAP CAV solenoid valve. If there is no battery voltage, check the wire harness. Install the tubes to the EVAP CAV solenoid valve and connect the 2P (Black) connector. Coat the inside of the carburetor insulators with clean engine oil for ease of installation. 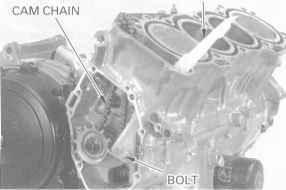 Install the carburetor assembly onto the cylinder head. Tighten the engine side insulator screws so that the band ends clearance is 11 13 mm (0.4 0.5 in). Connect the throttle cable ends to the throttle drum and install the throttle cables on to the cable holder. Connect the choke cable end to the starting enrichment valve arm. 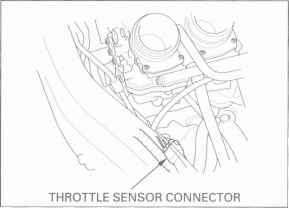 Connect the throttle sensor connector. Remove the screw and the handlebar grip end. Disconnect the front brake switch wires connectors from the switch. 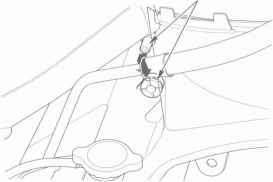 Remove the master cylinder holder bolts, holder and master cylinder assembly. 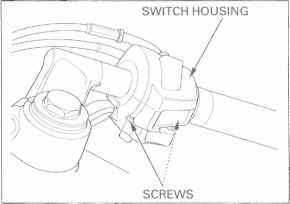 Remove the right handlebar switch throttle housing screws. Disconnect the throttle cable ends from the throttle Remove the throttle pipe from the right handlebar. Install and tighten the assembly bolt to the speci TORQUE 13 N-m 1.3 kgf-m , 9 lbf-ft Check the oil pump operation by turning the pump shaft. If necessary, reassemble the oil pump. 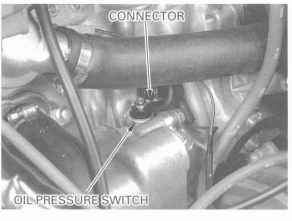 Install the oil pressure relief valve with its smal O.D. side facing the spring. 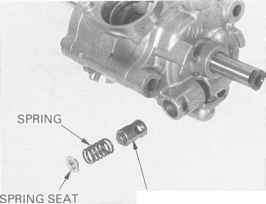 Install the spring and spring seat. 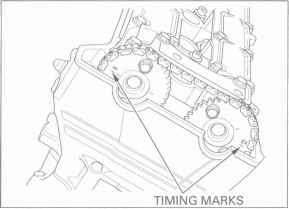 Turn the adjusting bolt with the engine hanger bolt counterclockwise to release the adjusting bolt from the engine. 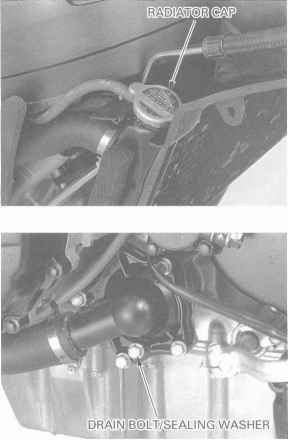 Support the engine using a jack or other adjustable support to ease of engine hanger bolts removal. 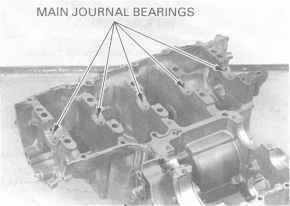 Remove the right engine hanger bolt and distance collar. Remove the left engine hanger bolts. 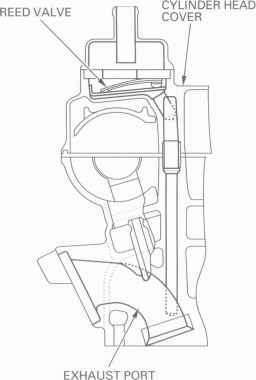 The EVAP purge control valve should be inspected if hot restart is difficult. 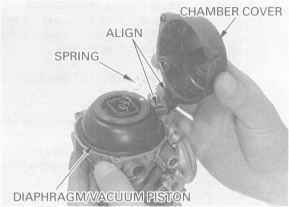 Remove the EVAP purge control valve from the air cleaner housing. Connect the vacuum pump to the No. 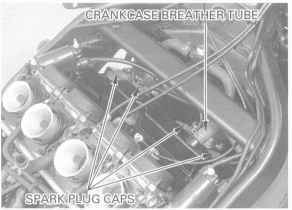 5 tube fitting output port that goes to the carburetors. 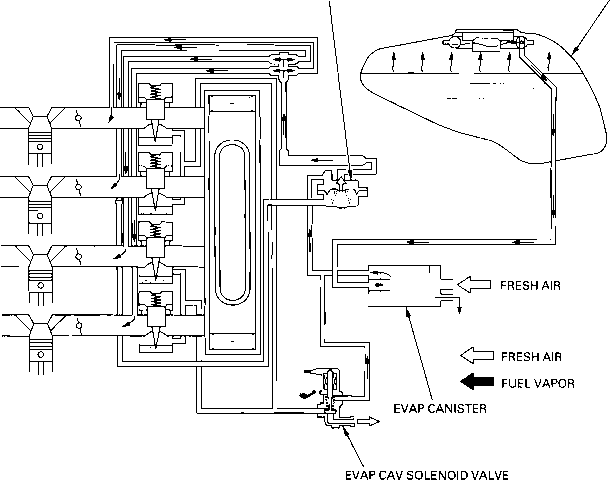 Apply the specified vacuum to the EVAP purge control valve. SPECIFIED VACUUM 250 mm Hg 9.8 in Hg The specified vacuum should maintained. 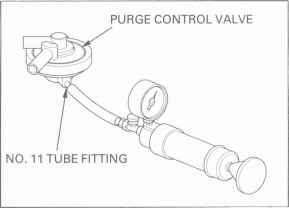 Replace the EVAP purge control valve if vacuum is not maintained. 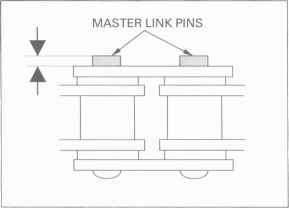 Disconnect the fan motor switch 3P White connector. 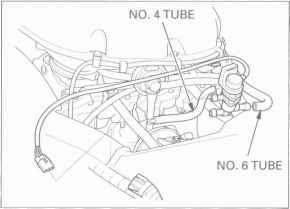 Release the air guide hooks from the oil cooler hoses. 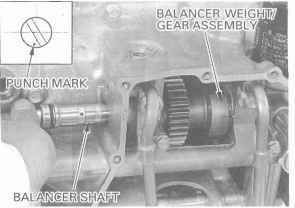 Remove the upper mounting bolt and collar. Release the radiator from the lower bracket. Lower the left side of the radiator down and slide the radiator rightward, then release the grommet from the frame boss. 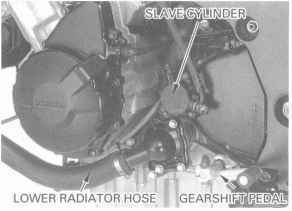 Remove the radiator and air guide as an assembly. CAUTION Be careful not to damage the radiator core. 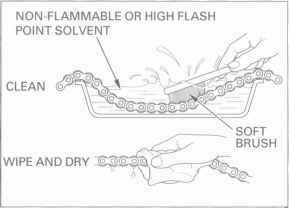 Check the coolant level of the reserve tank with the engine running at normal operating temperature. The level should be between the UPPER and LOWER level lines. If necessary, add recommended coolant. Remove the seat page 2-2 . 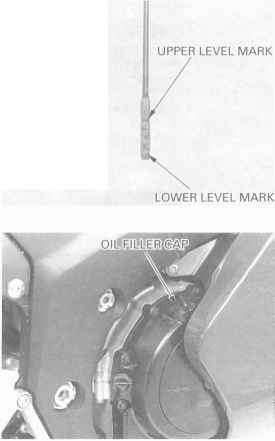 Remove the reserve tank filler cap and fill to the UPPER level line with 50 50 mixture of distilled water and antifreeze. 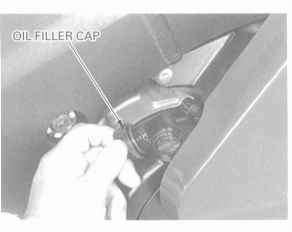 Reinstall the filler cap. 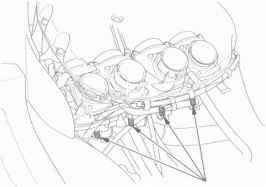 Align the inner panel with the frame boss and lower edge of the fuel tank, then install the boss into the fuel tank gromment. 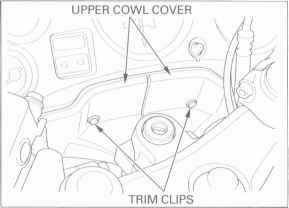 Install the both upper cowl cover. NOTE Align the upper cowl covers with the meter panel bosses. Temporarily install the special bolts. Install the upper ends of the windscreen special bolts cap nuts. 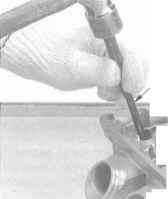 Tighten the cap nuts while holding the special bolts. Tighten the special bolts. They can easily be scored or scratched. 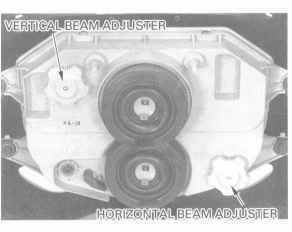 Install the pilot screw and return it to its original position as noted during removal. 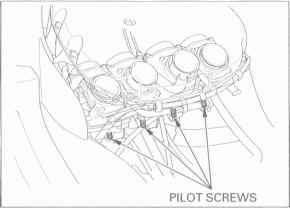 Perform the pilot screw adjustment procedure if a new pilot screw is installed page 5-21 . 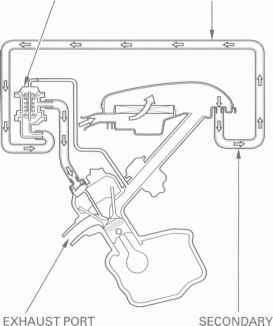 Install the float and float valve in the carburetor body, then install the float pin through the body and float. 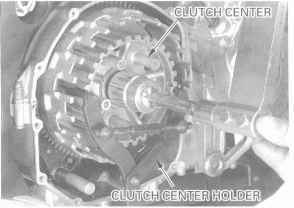 Synchronize the carburetors with the engine at normal operating temperature, transmission is in neutral and the motorcycle supported securely on a level surface. 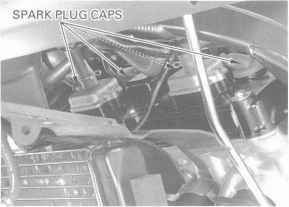 Remove the following Fuel tank page 2-2 Lower cowl page 2-7 Remove the vacuum plugs from the engine intake ports. Screw the adaptors in the intake ports. 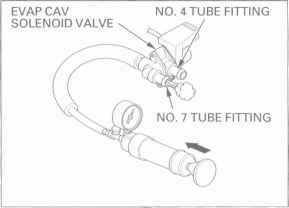 Install the 3-way joint to the fuel valve vacuum tube. Connect the fuel tube and vacuum tube to the fuel Connect the vacuum gauge tubes to the adaptors and 3-way joint.